Bosch was born in 1450 AD into an artistic family in Hertogenbosch, Netherlands. He spent most of his life in this general area; this was unusual for Dutch painters who usually traveled to improve their art style. In his youth, he was trained locally and by his family. When he was 36, he joined The Brotherhood of Our Lady, a church group who trained him. This group also was his patron along with other Dutch noblemen. Little is known about his life, but it is known that he was incredibly pessimistic about life and where society was headed towards. 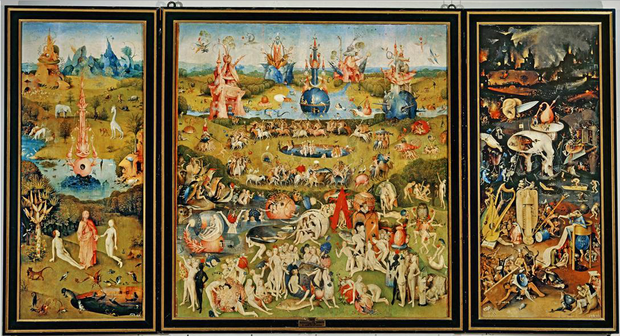 Bosch was a painter, and painted many painting including The Garden of Earthly Delights, The Temptation of St Anthony, and Terrestrial Paradise. The Garden of Earthly Delights was created from 1503 to 1515 in oil paints. It is located in Museo del Prado, a museum in Madrid. The significance of this masterpiece is in the symbolism. Everything in the painting is a symbol, down to the giant strawberry representing "transient natures and earthly pleasures" (Alberti 1). While no new techniques were used, it is different from other Renaissance paintings in that there were creatures neither Christian or Pagan; just fantasy. With these unethical beings, the painting is still considered to be very religious, showing the Garden of Eden into our progression to hell. I find this painting to be interesting because of the intricate detail and symbolism of every aspect. The magical creatures seem almost Doctor Seuss like, or in the realm of Alice and Wonderland. However, if you look more closely, everything is twisted into horror to show a steep decline into our ultimate and inescapable fate of damnation. The madness of all of this is amazing and beautiful. The "ism" that is most prominent in this painting is humanism, but only some very specific aspects of it. It shows human relationships, interacting and loving each other all in their truest and purest form. It shows progression, how we went from almost nothing in Eden to an insanely functioning world. However, this picture is also a very religious painting, stepping away from it's humanistic side. Alberti. “Alberti’s window.” Blogspot. 9 July 2011. Bosch, Hieronymus. The Garden of Earthly Delights. 1504. Museo Del Prado, Madrid, Spain. Artstor. Artstor. Web. 03 Dec. 2015. Chadwick, Whitney. “Garden of Earthly Delights.” World art. Annenberg Learner, 2006. Hickson, Sally. “Bosch, The Garden of Earthly Delights.” Khan Academy. Khan Academy, n.d.
"Hieronymus Bosch." Encyclopedia of World Biography. Detroit: Gale, 1998. Biography in Context. Web. 3 Dec. 2015.